Magic Wings' outdoor gardens are totally accessible for all. We believe that everyone deserves to enjoy all that we have to offer. The one-acre outdoor garden area at Magic Wings has been planted with many types of native flowers and trees. During the warm weather, these plants attract native butterfly species, allowing you to see them in their natural habitat. 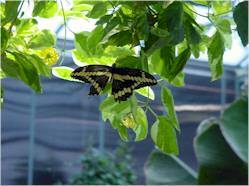 Butterfly gardens are beneficial to the environment. Native plants thrive in your local area gardens, much more so than commercial and foreign varieties. We are responsible for destroying many wildlife habitats. Starting a butterfly garden is one way you can help preserve, protect and possibly assist in bringing back many species of butterflies to your area. The pure enjoyment of watching butterflies in your own garden. Just follow these steps to enjoy the wondrous sight of butterflies flitting from flower to flower in the sunlight during the spring, summer and fall. And then in the winter, you can visit Magic Wings and enjoy our butterflies! The main food of adult butterflies is nectar from flowers. Group different flowers together to make them more enticing to butterflies. Include different types, sizes and heights of nectar flowers throughout the blooming season and create a 360Âº line of sight for the butterflies. 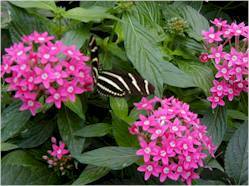 Pentas is a good nectar source. Look closely and you can see a female Giant Swallowtail laying her eggs on a citrus plant. Her abdomen is extending forward to deposit one egg at a time on the leaf. Caterpillars require different menus than adult butterflies. They eat the leaves and sometimes flowers and seeds of certain plants. The adult female butterfly chooses specific plants and then lays her eggs on them. 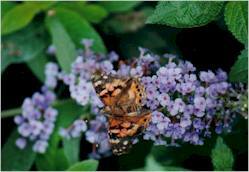 By planting larval food plants, you will attract egg-laying female butterflies to your garden. 3) Choose a Sunny Location Sun is important for both butterflies and flowers. Butterflies need sun to keep their bodies warm enough to fly, eggs and caterpillars are able to develop more rapidly when they are warm and sunshine is necessary for flowers to grow. Providing lots of sunlight to your garden benefits butterflies, plants and flowers. These 3 Julias are sunning themselves (basking) on this rock in our conservatory. Your butterfly garden needs to be sheltered from the wind. Butterflies won't have to worry about expending extra energy fighting wind currents and their body temperatures won't be cooled down by the breezes. Warm, sheltered areas help flowers bloom earlier in the spring and keep blooming longer in the fall. Additionally, place large rocks in strategic locations that get the full sun, so that butterflies can bask in the warmth. Butterflies are insects, so pesticides that rid your garden of insect pests will also rid your garden of butterflies. This includes the use of the bacterial insecticide BT, which will kill butterfly larvae (caterpillars). Research natural methods to keep your garden healthy. Check your garden daily for common garden pests. If you do detect aphids or beetles, a fine spray of the garden hose should get rid of them. Protect larvae by not using pesticides. So you don't have a house with a yard? No problem. A butterfly garden can bloom from your deck or balcony or even a window box. Butterflies have an extremely sensitive sense of smell. They can identify their favorite plants from miles away and travel long distances just for the nectar. The trick is to include colorful flowering nectar plants and maybe a host plant or two for specific butterflies. Careful planning will result in the perfect invitation to those winged creatures for long term residency to your butterfly garden. 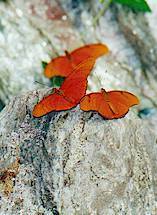 In the last century, butterfly species, along with other wildlife around the world, have been declining dramatically. The first known extinction (the Boisduval's Satyr) occurred in 1880 in the sand dunes of San Francisco, and that same city's growth exterminated the Xerces Blue in 1942. The last colony of California's Palos Verdes Blue was plowed under by the city of Rancho Palos Verdes in the spring of 1984 during construction of a ball field. Magic Wings Butterfly Conservatory and Gardens actively educates and encourages individuals to support the creation and preservation of native butterfly and moth habitats throughout the Pioneer Valley of Western Massachusetts.